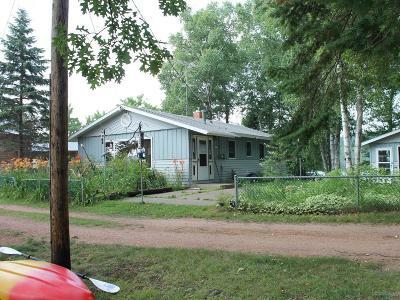 LAKE NOKOMIS COTTAGE- If you are looking to down size or have a get away on the lake and spend under $185, 000, this house is for you. The house sits at the end of a dead end road and has views of Lake Nokomis on both sides. There is a large sand beach on one side of the property. There are large garden areas just waiting for you to move in with a green thumb. Enjoy your coffee on the 24x15 concrete patio over looking the water. The house has 2 bedrooms, but one of them is huge and could be divided. The master bedroom has a spacious walk in closet and make up vanity. There is a full bath. Enjoy cool nights in front of the gas brick fireplace. There are beautiful French doors separating the living and dining area. Enjoy the views from the large windows. This property has a one car garage but an additional storage area for all your water toys. The storage area has double doors to drive in larger toys.